The vision and aim of our Multiple Myeloma Research Laboratory, led by Priv.-Doz. Dr. med. Dr. biol. hom. Dirk Hose and Dr. Anja Seckinger, is the understanding of the pathogenesis of multiple myeloma and corresponding plasma cell diseases like AL-amyloidosis including the development of novel therapeutic approaches. Our ultimate goal is a cure for our patients. Research interests are basic and applied science regarding i) molecular pathogenesis of malignant plasma cell diseases, focusing on multiple myeloma and its precursor diseases monoclonal gammopathy of unknown significance (MGUS) and asymptomatic multiple myeloma (AMM), as well as of AL-amyloidosis, ii) identification of target structures and development of novel therapeutic approaches, and iii) translation of results into clinical applications. Multiple myeloma is a rarely curable malignant disease of clonal plasma cells accumulating in the bone marrow causing clinical signs and symptoms related to the displacement of normal hematopoiesis, formation of osteolytic bone lesions, and production of monoclonal protein (Kyle and Rajkumar, N Engl J Med 2004). Before the onset of end organ damage (i.e. anemia, bone lesions, hypercalcemia, renal insufficiency), the disease is termed asymptomatic myeloma. Progression and evolution of asymptomatic myeloma from MGUS are thought to be due to an ongoing genetic instability with de novo appearing genetic alterations (Morgan et al., Nat Rev Cancer 2012). AMM evolves from MGUS with 1% and progresses to therapy-requiring myeloma with 10% probability per year (Kyle et al., N Engl J Med 2007 and 2018). Time to progression in individual patients ranges from few months to never in lifetime. Malignant plasma cells harbor a high median number of chromosomal aberrations (Figure 1) and multiple changes in gene expression compared to normal bone marrow plasma cells (BMPCs). The corresponding myelomatous bone marrow is significantly altered due to factors aberrantly expressed by myeloma cells or already expressed by normal plasma cells but present in higher abundance, and such expressed by a variety of cells within the (changing) bone marrow microenvironment. Fig. 1: Multiple myeloma cells harbor a high median number of chromosomal aberrations and show a high interpatient-variation (modified from Klein, Seckinger, Möhler, Hose, Recent Results Cancer Res 2011). Metaphase multicolor-fluorescence in situ hybridization. (A) Non-hyperdiploid karyotype with several structural (translocations t(1;10), t(2;2), t(4;7), t(6;8), t(11;12), t(19;2;19), t(1;20)) and numerical (deletion of chromosomes or chromosomal regions 5, 13, and 14q, respectively) aberrations. (B) Hyperdiploid karyotype with multiple gains, characteristically of odd numbered chromosomes, and additional structural aberrations, including recurrent (t(11;14)), and non-recurrent translocations, e.g. t(11;17) and t(1;11). Two principal pathways target plasma cell precursors (pre-BMPCs): Translocations most often involving the IgH-locus, and a hyperdiploid pathway (Figures 1 and 2). Both lead to increased cyclin-D (CCND) expression: overexpression (CCND2) or aberrant expression (CCND1, CCND3). Karyotypic instability, assumed by others as principle driver of evolution of asymptomatic myeloma from MGUS and subsequent progression to symptomatic multiple myeloma (red question marks), is in place only at this time (indicated by red stars). Targeted pre-BMPCs home to the normal plasma cell niche (indicated by a gray box). These cells already have a slightly dysregulated cell cycle (“hijacked normal” plasma cells) and the tendency to accumulate. The bone marrow microenvironment (light-gray box) is unaltered. In pre-MGUS stage, the transformation process of the bone marrow microenvironment begins slowly. Initially, pre-MGUS cells share the niche with normal plasma cells. A further accumulation leads to MGUS/AMM stage without the necessity of further genetic events. The microenvironment is slowly transformed by normal bone marrow plasma cell factors (indicated by the increasingly dark grey) and aberrantly expressed factors (red dots). Aberrant expression is driven mainly by the changing bone marrow microenvironment, not accumulating genetic alterations. Malignant plasma cells populate existing plasma cell niches (light gray boxes), recruit new niches (dark gray boxes) and partially gain independence from the microenvironment (plasma cell without a box). Further accumulation of myeloma cells leads to symptomatic myeloma. The transformation of the microenvironment continues (darkening gray, increased number of (aberrantly) expressed factors) in a positive feedback loop. A further selection pressure to recruit new niches and grow independently of niches is in place. Within this model, open questions are how myeloma cells can spread over the bone marrow, what the role of genetic heterogeneity is, and how it can be explained that some MGUS or AMM-patients remain without disease progression. Human myeloma cell lines (HMCL) can be derived from therapy-requiring or relapsed myeloma, i.e. cells which already gained partial independence of the microenvironment. They are thought to represent a further step of myeloma development. The same holds true for extramedullary myeloma, appearing rarely, even in end-stage patients. Figure 2. Our lab’s model of myeloma pathogenesis (modified from Klein, Seckinger, Möhler, Hose, Recent Results Cancer Res 2011). See text for details. Despite recent approval of multiple agents, e.g. daratumumab, elotuzumab, carfilzomib, pomalidomide, it is rare to eradicate all myeloma cells and the vast majority of patients ultimately becomes either refractory to all available compounds or can no longer be treated effectively due to toxicity of previous treatments, and thus succumbs to the disease. Here, alternative immunotherapeutic options represent an attractive strategy to cover this unmet medical need PREVIOUS AND CURRENT RESEARCH. Our lab has a long-term experience in the molecular characterization of myeloma cells, the identification of novel therapeutic target structures, and the pre-clinical testing of novel compounds. Since 2002, the laboratory has generated one of the largest datasets in terms of gene expression profiling using DNA-microarrays (together with Prof. Bernard Klein and Prof. Jérôme Moreaux, Montpellier, France) and next generation sequencing (together with Dr. Vladimir Benes, EMBL Heidelberg. Germany), respectively, as well as interphase fluorescence in situ hybridization (iFISH; in cooperation with Prof. Anna Jauch, Heidelberg, Germany) of myeloma and AL-amyloidosis patients worldwide SELECTED PUBLICATIONS. Results can be reported in clinical routine to patients and clinicians using a gene expression-based report which was developed in our laboratory (Meißner et al., Clin Cancer Res 2011). Our gene expression report GEP-R is a non-commercial, adaptable software framework which includes molecular classifications, risk stratification and assessment of target gene expression into one report. Furthermore, the GEP-R runs a quality and identity control and is finally reported as pdf-document. Within the GEP-R, the implemented HM-metascore integrates current gene expression-based and conventional prognostic factors into one superior prognostic classification allowing to give a clear message to treating physicians and patients. The tool can be downloaded at http://code.google.com/p/gep-r . Due to the adaptable interface, the GEP-R can be adapted to current results, thus enabling for example the integration of novel therapeutic targets or risk factors. Besides, the GEP-R is adaptable to other cancer entities. Current exemplary research projects include the DFG Sonderforschungsbereich SFB/TRR79 and the novel DFG Priority Programme “µBONE - Colonisation and Interactions of Tumor Cells within the Bone Microenvironment“ (SPP 2084) focusing on the pathogenesis of myeloma induced bone disease as well as the development of substitute materials for bone defects and novel imaging approaches, and the BMBF e:Med systems medicine initiative CLIOMMICS. The latter focusses on the clinical application and combination of “omics”-based methods for target identification, development of novel therapeutic approaches, and prediction of treatment side effects and prognosis. 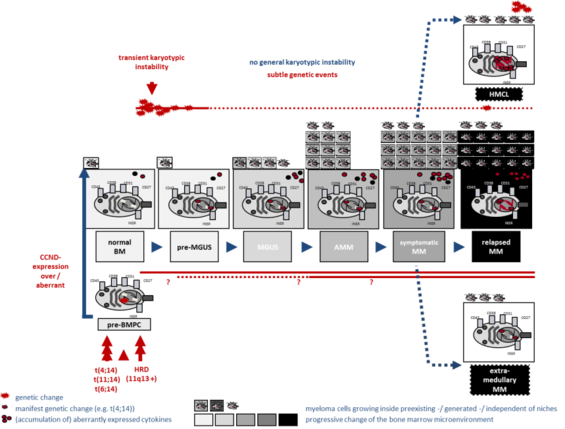 The research goal of our project here includes performing and reporting of RNA-sequencing based assessment of survival, therapeutic targets, and biological parameters in clinical routine based on strategies for the GEP-R (see above). Our research is only possible and in various national and international collaborations. Exemplary results regarding target identification and development of novel treatment strategies and clinical translation are exemplified by the development of the BCMA T-cell bispecific antibody EM801 (EM901) [link PREVIOUS AND CURRENT RESEARCH] recently published (Seckinger et al., Cancer Cell 2017), which is foreseen to enter the first-in-man clinical trial in the first half of 2018 at our institution and the University of Pamplona, Spain. The second result regarding molecular pathogenesis relates to the progression of asymptomatic to symptomatic myeloma and the role of chromosomal aberrations here in PREVIOUS AND CURRENT RESEARCH (Neben, …, Seckinger, …, Hose, J Clin Oncology 2013). Here we found that the same chromosomal aberrations drive progression from asymptomatic to symptomatic myeloma, which are also adverse prognostic in symptomatic myeloma (i.e. t(4;14), deletion 17p13, gain of 1q21), with the exception of hyperdiploid myeloma. Both research projects are described in more detail below. T-cell bispecific antibodies (TCBs) that simultaneously bind a surface target on tumor cells and an associated T-cell receptor chain (CD3ε) present on all T-cells have shown the capacity to induce a potent T-cell mediated killing of cells carrying the target, and are in principle applicable to all patients. In a collaborative approach with the group of Prof. San Miguel (Pamplona, Spain) as well as EngMab AG and Roche Glycart (both Switzerland) we identified the TNF receptor superfamily member B-cell maturation antigen (BCMA) as excellent target in in 684 previously untreated and 94 relapsed myeloma patients, including those with high-risk features, by gene expression profiling, RNA-sequencing, and/or flow cytometry. Next, we constructed a first-in-class IgG-based BCMA-T-cell bispecific antibody (EM801), subsequently assessing its mechanism of action. 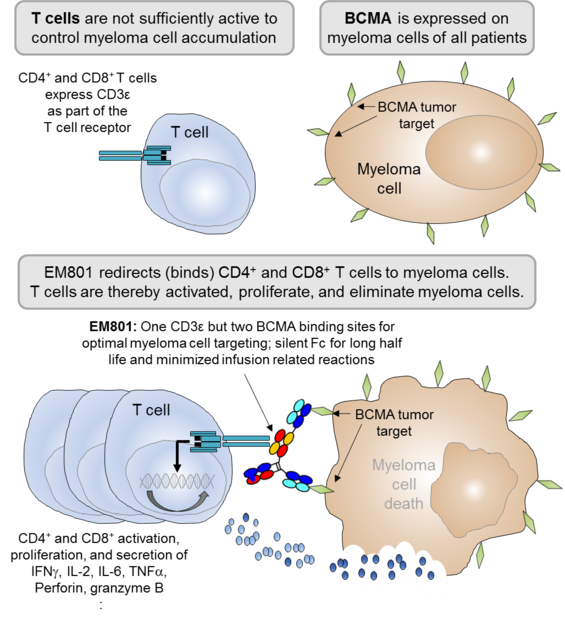 Simultaneous binding of EM801 to CD3ε on T-cell and BCMA on myeloma cell resulted in strong T-cell-tumor cell interaction. In a concentration-dependent manner, EM801 couples CD3+ T-cells and myeloma cells as measured by atomic force microscopy. The binding interaction between T-cells and myeloma cells led to T-cell receptor/CD3 crosslinking and activation of the CD3 downstream signaling pathway. Increasing concentrations of EM801 lead to higher T-cell activation in primary bone marrow samples, with significantly increased expression levels of CD69, CD25 and HLA-DR in both CD4+ and CD8+ T-cells compared to a control TCB and significant and dose-dependent secretion of cytokines and cytolytic proteins, e.g. interferon-γ, granzyme B, and perforin as measured by ELISA. By this, EM801 induced significant cell death in malignant plasma cells from previously untreated and relapsed/refractory myeloma patients incl. heavily pretreated ones. See Figure 3 for the mechanism of action. Toxicity on other cells of the bone marrow microenvironment was negligible. Figure 3. Principal mechanism of action of BCMA-TCB EM801 (Seckinger et al., Cancer Cell 2017). See text for details. For symptomatic multiple myeloma, chromosomal aberrations determine prognosis under different treatment regimen. Most frequently associated are translocation t(4;14), deletion 17p13, and gain 1q21. Aim of our study was to analyze chromosomal aberrations in terms of frequency and impact on time to progression in patients with smoldering multiple myeloma on the background of clinical prognostic factors. 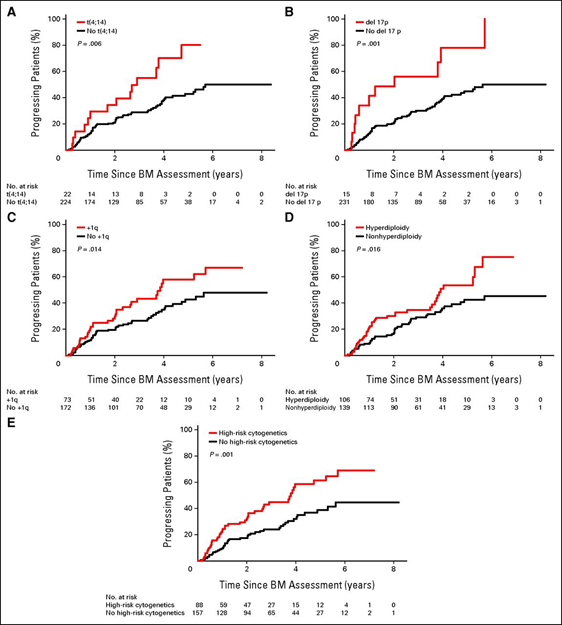 We found that the “high-risk” aberrations in active myeloma, i.e. del 17p13, t(4;14), and gain 1q21, present in 6.1%, 8.9% and 29.8% of patients, significantly confer adverse prognosis in smoldering myeloma, respectively (Figure 4). Contrary to active myeloma, hyperdiploidy, present in 43.3% of patients, is an adverse prognostic factor. In contrast to therapy requiring myeloma, translocation t(11;14) is associated with slower progression. The percentage of malignant bone marrow plasma cells assessed by iFISH, and combination of M-protein and plasma cell infiltration as surrogates of tumor load significantly confer adverse prognosis. In multivariate analysis, “high-risk” aberrations, hyperdiploidy, and surrogates of tumor load are independently prognostic. In conclusion, the “high-risk” chromosomal aberrations deletion 17p13, t(4;14), and gain 1q21 are adverse prognostic factors in smoldering as in active myeloma, independent of tumor mass. Hyperdiploidy is the first example for an adverse prognostic factor in smoldering myeloma of opposite predictiveness in active myeloma. Risk association of chromosomal aberrations is thus not only a priori treatment dependent (predictive), but also an intrinsic property of myeloma cells (prognostic). Figure 4. Impact of gain 1q21, deletion 17p13, t(4;14), and ploidy status on time to progression in patients with smoldering myeloma. (A-D) Patients with myeloma were stratified by the presence or absence of each of the specific cytogenetic abnormalities showing statistical significance in univariate analysis. (E) Impact of “high risk” defined as the presence of any of the chromosomal abnormalities deletion 17p13, t(4;14), or 1q21 gain versus “standard risk” defined as the absence of any of these abnormalities. BM, bone marrow. A. Seckinger*, J.A. Delgado*, S. Moser, L. Moreno, B. Neuber, A. Grab, S. Lipp, J. Merino, F. Prosper, M. Emde, C. Delon, M. Latzko, R.Gianotti, R. Lüoend, R. Murr, R.J. Hosse, L.J. Harnisch, M. Bacac, T. Fauti, C. Klein, J. Hillengass, E.A. Cavalcanti-Adam, A.D. Ho, M. Hundemer, J. San Miguel, K. Strein, P. Umaña, D. Hose*#, B. Paiva* M.D. Vu*. [*shared, #lead contact] Target Expression, Generation, Preclinical Activity and Pharmacokinetics of the BCMA T-cell Bispecific Antibody EM801 for Multiple Myeloma Treatment. Cancer Cell. 31 (2017) 396-410. M.M. McDonald, M.R. Reagan, S.E. Youlten, S.T. Mohanty, A. Seckinger, R.L. Terry, J.A. Pettitt, M.K. Simic, T.L. Cheng, A. Morse, L.M.T. Le, D. Abi-Hanna, I. Kramer, C. Falank, H. Fairfield, I.M. Ghobrial, P.A. Baldock, D.G. Little, M. Kneissel, K. Vanderkerken, J.H.D. Bassett, G.R. Williams, B.O. Oyajobi, D. Hose, T.G. Phan, P.I. Croucher. Inhibiting the osteocyte-specific protein sclerostin increases bone mass and fracture resistance in multiple myeloma. Blood. 129 (2017) 3452-3464. T. Bochtler, U. Hegenbart, C. Kunz, A. Benner, C. Kimmich, A. Seckinger, D. Hose, H. Goldschmidt, M. Granzow, P. Dreger, A.D. Ho, A. Jauch, S.O. Schönland. Prognostic impact of cytogenetic aberrations in AL amyloidosis patients after high-dose melphalan: a long-term follow-up study. Blood. 128 (2016) 594-602. T. Bochtler, U. Hegenbart, C. Kunz, M. Granzow, A. Benner, A. Seckinger, C. Kimmich, H. Goldschmidt, A.D. Ho, D. Hose, A. Jauch, S.O. Schönland. Translocation t(11;14) is associated with adverse outcome in patients with newly diagnosed AL amyloidosis when treated with bortezomib-based regimens. J Clin Oncol. 33 (2015) 1371-8. H. Salwender, H. Goldschmidt. Phase III trial of bortezomib, cyclophosphamide, dexamethasone (VCD) versus bortezomib, doxorubicin, dexamethasone (PAd) in newly-diagnosed myeloma. Leukemia. 29 (2015) 1721-9. K. Neben, A. Jauch, T. Hielscher, J. Hillengass, N. Lehners, A. Seckinger, M. Granzow, M.S. Raab, A.D. Ho, H. Goldschmidt, D. Hose. Progression in Smoldering Myeloma Is Independently Determined by the Chromosomal Abnormalities del(17p), t(4;14), gain 1q, Hyperdiploidy, and Tumor Load. J Clin Oncol. 31 (2013) 4325-32. N. Weinhold, D.C. Johnson, D. Chubb, B. Chen, A. Försti, F.J. Hosking, P. Broderick, Y.P. Ma, S.E. Dobbins, D. Hose, B.A. Walker, F.E. Davies, M.F. Kaiser, N.L. Li, W.A. Gregory, G.H. Jackson, M. Witzens-Harig, K. Neben, P. Hoffmann, M.M. Nöthen, T.W. Mühleisen, L. Eisele, F.M. Ross, A. Jauch, H. Goldschmidt, R.S. Houlston, G.J. Morgan, K. Hemminki. The CCND1c.870G>A polymorphism is a risk factor for t(11;14)(q13;q32) multiple myeloma. Nat Genet. 45 (2013) 522-5. A. Seckinger, T. Meißner, J. Moreaux, D. Depeweg, J. Hillengass, K. Hose, T. Rème, A. Rösen-Wolff, A. Jauch, R. Schnettler, V. Ewerbeck, H. Goldschmidt, B. Klein, D. Hose. Clinical and Prognostic Role of Annexin A2 in Multiple Myeloma. Blood. 120 (2012) 1087-94. P. Sonneveld, I.G. Schmidt-Wolf, B. van der Holt, L. El Jarari, U. Bertsch, H. Salwender, S. Zweegman, E. Vellenga, A. Broyl, I.W. Blau, K.C. Weisel, S. Wittebol, G.M. Bos, M. Stevens-Kroef, C. Scheid, M. Pfreundschuh, D. Hose, A. Jauch, H. van der Velde, R. Raymakers, M.R. Schaafsma, M.J. Kersten, M. van Marwijk-Kooy, U. Duehrsen, W. Lindemann, P.W. Wijermans, H.M. Lokhorst, H. Goldschmidt. Bortezomib Induction and Maintenance Treatment in Patients With Newly Diagnosed Multiple Myeloma: Results of the Randomized Phase III HOVON-65/ GMMG-HD4 Trial. J Clin Oncol. 30 (2012) 2946-2955. D. Hose, T. Rème, T. Hielscher, J. Moreaux, T. Meissner, A. Seckinger, A. Benner, J.D. Shaughnessy, Jr., B. Barlogie, Y. Zhou, J. Hillengass, U. Bertsch, K. Neben, T. Mohler, J.F. Rossi, A. Jauch, B. Klein, H. Goldschmidt. Proliferation is a central independent prognostic factor and target for personalized and risk-adapted treatment in multiple myeloma. Haematologica. 96 (2011) 87-95. T. Meissner, A. Seckinger, T. Rème, T. Hielscher, T. Mohler, K. Neben, H. Goldschmidt, B. Klein, D. Hose. Gene expression profiling in multiple myeloma–reporting of entities, risk, and targets in clinical routine. Clin. Cancer Res. 17 (2011) 7240-7247. A. Seckinger, T. Meissner, J. Moreaux, H. Goldschmidt, G.M. Fuhler, A. Benner, M. Hundemer, T. Rème, J.D. Shaughnessy, Jr., B. Barlogie, U. Bertsch, J. Hillengass, A.D. Ho, V. Pantesco, A. Jauch, J. de Vos, J.F. Rossi, T. Möhler, B. Klein, D. Hose. Bone morphogenic protein 6: a member of a novel class of prognostic factors expressed by normal and malignant plasma cells inhibiting proliferation and angiogenesis. Oncogene. 28 (2009) 3866-3879. D. Hose, T. Rème, T. Meissner, J. Moreaux, A. Seckinger, J. Lewis, V. Benes, A. Benner, M. Hundemer, T. Hielscher, J.D. Shaughnessy, Jr., B. Barlogie, K. Neben, A. Kramer, J. Hillengass, U. Bertsch, A. Jauch, J. de Vos, J.F. Rossi, T. Mohler, J. Blake, J. Zimmermann, B. Klein, H. Goldschmidt. Inhibition of aurora kinases for tailored risk-adapted treatment of multiple myeloma. Blood. 113 (2009) 4331-4340. D. Hose, J. Moreaux, T. Meissner, A. Seckinger, H. Goldschmidt, A. Benner, K. Mahtouk, J. Hillengass, T. Rème, J. de Vos, M. Hundemer, M. Condomines, U. Bertsch, J.F. Rossi, A. Jauch, B. Klein, T. Mohler. Induction of angiogenesis by normal and malignant plasma cells. Blood. 114 (2009) 128-143.